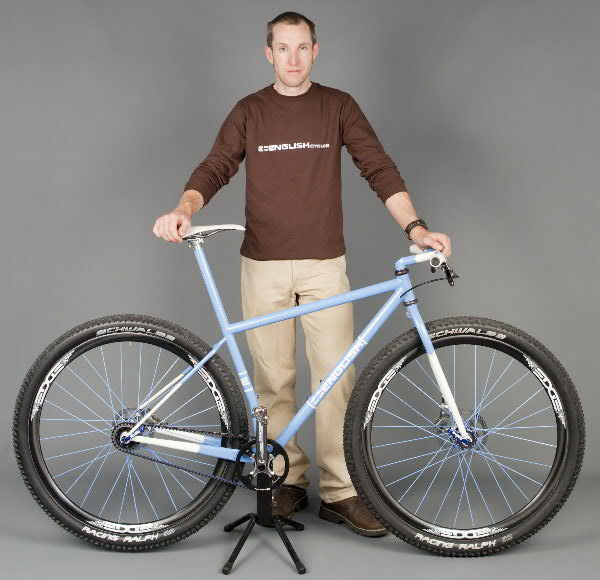 Rob English is focused on engineering, development and supporting production at Bike Friday, the packable bike/folding bike company based in Eugene, Oregon. That’s one job. He’s also a custom frame builder who hawks his wares under the English Cycles flag, and he’s a defending three-time state time-trial champion. In early March, he was putting in his base miles, training 12 to 18 hours a week. He also displayed five English Cycles bikes at the North American Handmade Bicycle Show in Sacramento, California. How did the show go for you? We certainly had lots of interest. The booth was pretty much packed the whole weekend. I got interviewed by five or six journalists, and I was on all the major cycling websites, so just in terms of media exposure alone, it is the show. To actually meet the public and for them to come and see the bikes in person is a big plus, too. That seems to be enough. The web’s a wonderful thing. I don’t know how you would have done this business before. My customers are really good at posting on various forums which gets more traffic to my website, so I don’t really have to do much in the way of marketing. Most of your show coverage focused on two bikes. Tell me about Project Light first. Project Light weighs 10.8 pounds. I’ll be racing it this season. Because everything I build is custom, everything is built for a rider of a particular weight. In this case, it’s built for me at 145 pounds. I have built a sub-13 pound bike for a guy at 200 pounds. I particularly enjoy building for the small and light riders because typically they’ve been on bikes that were horrendously overbuilt for them—because nobody designs a bike for a 110-pound rider in a production setting. They can’t. They never know who’s going to jump on the thing. My frame is very light for a steel frame, but the bulk of the weight is saved on the components. At the end of the Cold War when all the aerospace people needed something else to do, a lot of them started making bicycle components and using the high-strength alloys and carbon fiber. You can knock off a lot of weight using high-end components. Still, there’s a lot of steel to deal with. What changed about steel in recent decades that allows for lighter frames? Steel’s quietly evolved in the background. While carbon fiber’s been getting all the press, the steel alloys have pressed on. 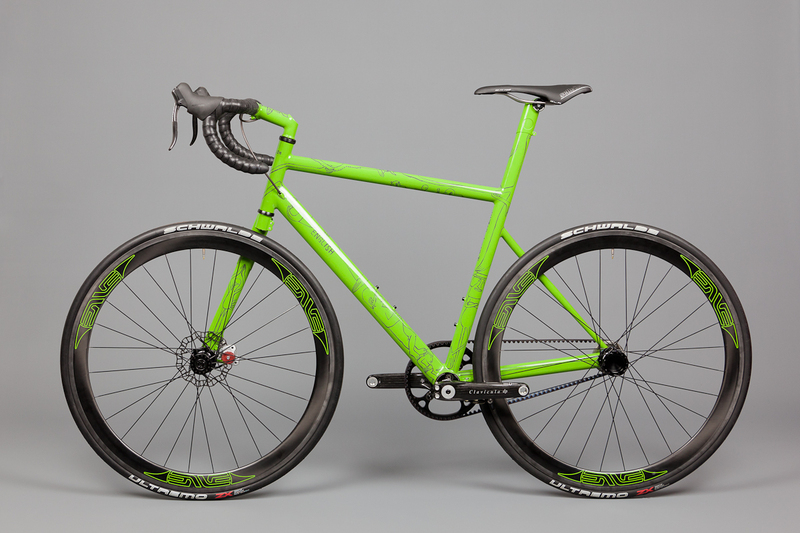 Reynolds, True Temper and Columbus all have very high-strength, thin-walled steel tubing, and you can build a light steel frame that will be durable and perform just as well as a carbon frame. The heat-treating process has also improved—and the ability to draw very thin sections in the butted tube. In between the butts [the thicker ends of a single frame tube], the finished tubes I use are 0.4 mm wall thickness. So you can pretty much squeeze them with your fingers, but that tube is still very stiff and strong. The Project Light frame weighs 1200 grams, including seatmast. Now, Nick Crumpton had a 666-gram carbon frame at the show, so if you want to build the lightest bike, then clearly carbon is the way to go. But with careful component selection on the light steel frame, I can get an exceptionally light bicycle and have that kind of cache of having a steel bike, or a mostly steel bike. That’s right, the seatmast on Project Light is all carbon fiber, from the bottom bracket to the seat. How did you come to that design choice? 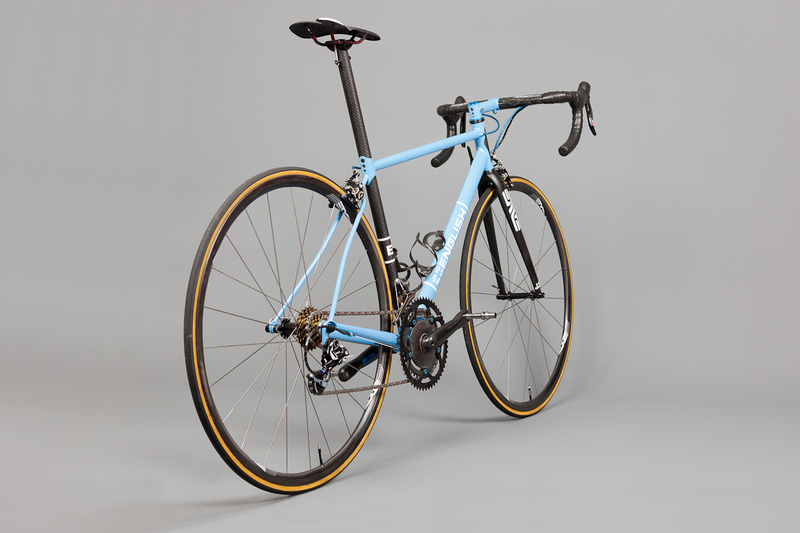 The bike I’ve been racing the past three years is essentially the same as Project Light but with a steel seatmast, and I enjoyed riding that bike at 11.3 pounds. I couldn’t really take any more weight out of an all-steel frame, and so I started thinking about what else I could do. One reason for the carbon seatmast is when Enve makes the tube for me, I can specify how stiff I want that carbon tube and in which direction the stiffness should be. So I can tune it for comfort because that long cantilevered section of seatmast, if desired, can be tuned to flex, to give a very nice comfortable ride with a very stiff rear triangle. So you get a solid power transfer but have a comfortable ride. 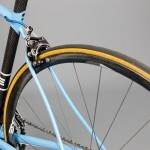 Let’s take a look at another star of the Handmade Bicycle Show, Project Right. Is there any good reason to build a bike with a single fork blade and a single-sided rear end other than to say you can? It’s nice to be able to change a flat tire without taking a wheel out and, in the case of this particular bike, having the belt drive on the outside of the frame means there’s no need to have a split in the frame for installing the belt. That gives you two advantages. But it was more we did it because we could. And you built this one for a customer, right? How does it ride? That’s for a customer. I test rode the bike and honestly, it’s just a bike. You can’t really tell. The only thing I could notice was if I really got on the drops and sprinted there’s a little bit of flex in the front end, but I could only notice it if I looked down at the tire. The back end is rock solid. I’m a firm believer that bikes should be engineered to be bicycles first. The aesthetic, or the cool factor, should be a distant second. It definitely has to be a rideable bike. Where did the hubs come from? 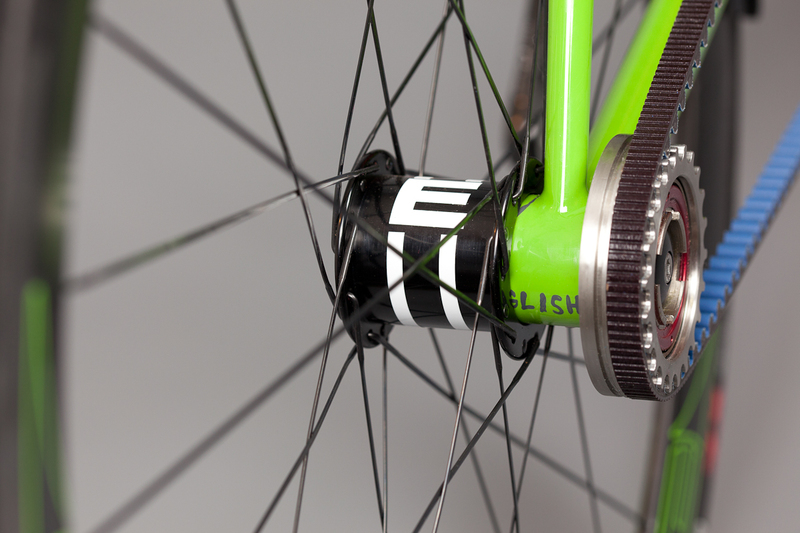 The front hub is a standard Lefty hub that would go on a Cannondale mountain bike fork, which is a single-sided design. The rear hub I custom machined myself. The bearings are pressed into the frame, so the one-piece hub and axle slides through those bearings, and then there’s a carrier for the freewheel which is splined onto the axle after it’s gone through the frame. First time you machined a single-sided hub? I’ve made more conventional hubs previously, but this was the first time for a single-sided one. The hub is pretty straight-forward. Once you’ve drawn it up, you just machine it to spec and it’s all relatively easy. The hard part on that bike was getting everything aligned on the frame and getting it to stay aligned. Normally when you braze up a rear triangle, you put a dummy axle in and while you’re brazing, nothing can move with the heat. In the case of this frame, there wasn’t anything for the other end of a dummy axle to attach to. I had to keep the bearing barrel of the dropout exactly parallel with the bottom bracket shell, so I ended up with the whole thing clamped down to the alignment table at the correct spacing whilst I brazed and whilst it cooled to make sure it all stayed perfectly aligned. I went very heavy on the safety factor. The hub is very overbuilt, 250 grams or something. There’s more metal there than probably needs to be, but I’m erring on the side of caution. I modeled the whole back of the bike in 3D CAD so I could assemble it all on screen and check clearances. That’s quite a useful tool for doing all the diagnostic stuff before you start. You’re interested in a wide range of bicycles. How do you account for that? I guess it comes from the engineering background. When I was a kid, the first time I saw a recumbent I was fascinated by the concept so that was the first bike I built when I was fifteen years old. I built myself a recumbent because, hey, I was fifteen. I couldn’t afford to buy one. I’m kind of intrigued by that idea. Bicycles are good. It doesn’t matter what type of bicycle it is. It’s all good. I enjoy the problem-solving aspect of really meeting the needs of the customer. But if you’re willing to make anything, how does a customer decide? This is something people have a hard time getting their heads around. Because they’re used to being presented with a range of models, and they have to choose one. People have a hard time with the fact that they can get anything they want. So I ask questions about their needs, uncover the shortcomings in their existing bikes, determine what they’re trying to fulfill with a custom machine and guide them through the myriad of options that are available. A customer in Canada came to me wanting a superlight kickbike for getting around town. Now I’ve never even ridden a kickbike so I didn’t have any basis of knowledge to fall back on of my own. I really had to quiz the customer a lot to fully understand what he liked, what he didn’t like and what he was looking for this time. I went back and forth on the design until I felt like I had a full understanding of what he wanted. And then I made it and it turns out that he’s super happy with it, and he’s now ordered a folding version. So that worked out well. What kind of machines will you be building this year? I’m building all kinds of stuff. I’m sold out through next April at this point. The next bike I’m building is a full-suspension recumbent, and then a road bike, a time trial bike and a tandem—kind of the full range of stuff, really. You’ve been building frames for a while now. What have you learned over the years? A friend of mine said, “Every day’s a school day.” My brazing’s got a lot better. I’ve learned about the importance of getting the miter on the tubing really, really tight because if the miters are spot on, there’s nowhere for the tube to move under the heat. The bike comes out straight the first time. The rest is just little bits and pieces of just refining my process to make it more accurate and faster. It helps me, coming from a production engineering background. I build my own tooling to make my process faster, more accurate and more easily repeatable. My tooling list is always getting longer. I always have to try to figure out when to stop and make the tools. It’s kind of a chicken-and-egg thing. If I make the tools, I’ll be able to make the bikes quicker and then have more time to make tools. So, yeah, I just keep learning all the time. It’s pretty safe to say you have a lot going on. What’s your personal schedule like? Right now, I’m three days a week at Bike Friday, and then two days a week—well, I guess four days a week in reality—working on my stuff at home. My goal this year is to try to get my weekends back, because last year I definitely didn’t say no enough. I took on more projects than I probably should have done last year and worked a lot. So I’m trying to find the right balance. Right now [early March 2012] with the base training period, I’m riding in the 12 to 18 hours a week range. It helps that we don’t have a car so all my riding counts as training. Anytime I’m riding anywhere is a training ride so that’s kind of helpful. I can pick and choose which days of the week I go into Bike Friday so I always look at the weather forecast. Today, when it was touching 70 degrees out, I got to go and do a nice long ride. You race at the Category 1, 2 level. What are your goals for riding? I’m just messing around at an amateur level, but part of the reason to race is the training. The racing is an excuse to do that training. I don’t race a lot these days because I don’t want to travel very much to races. I do mostly the local stuff. But I’m incredibly competitive and the bike racing is an outlet for that. It’s really fun being this fit, just being able to get on the bike and feel really strong and ride as far as I want and not have to worry about it. It’s a good feeling. I’ve only used it maybe four, five times this winter cause it’s been remarkably dry and I’ve been able to flex my days. If I didn’t live over a massive hill, I’d probably ride the velomobile more, but it’s a big heavy bike to ride back up the hill. But rainy days are fabulous, to get into town without getting wet. It’s got full running lights, turn signals, headlights, luggage compartment, parking brake—it’s pretty well set up. This is from Steve Schleicher, a kayak manufacturer in Canada who got interested in velomobiles probably five, six years ago. He’s now been building these shells to fit onto the Trice tricycle. I always wanted a velomobile, for years and years and years. Three years ago, I said I need to figure out how to get one of these trikes before I hit another winter for the sake of my sanity. Of course most of the European-made ones are incredibly expensive and have a waiting list of many years. Then I heard about Steve making the Borealis. Having a little bit of notoriety in the HPV world helps [Rob traveled 50.105 miles in one hour in the Varna II streamliner in 2007], so I called him up and told him who I was and got to chatting about stuff, and I eventually persuaded him to sell me the prototype bike that he’d been riding. I took the train up to Vancouver, got in the bike and rode it back. When I have to be at work at 7 in the morning in the dark and the cold and the rain, having that bike totally saves my sense of humor. Here’s information about Bike Friday, Eugene, Oregon, maker of packable and folding bikes, and here’s English Cycles‘ home on the web. In 2011, I talked to Rob about the packable tandem recumbent he and his wife took to New Zealand. In 2008, Rob took a pink Bike Friday Speeding tikit to the top of Philadelphia’s Manayunk Hill Climb, coming in first in the folding bicycle competition, with a time faster than all but seven riders in the Category 1, 2, 3 race. Here’s what he wrote about the event. And here are some pictures of the bike. In 2007, Rob discussed how he captured the British hour record in the streamlined Varna II. Steve Schleicher builds kayaks and velomobiles, including Rob’s Borealis, in British Columbia. Rob wrote about his Borealis here. 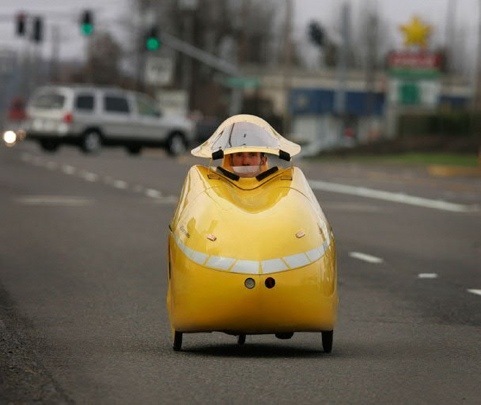 This entry was posted in Bike Friday tikit, Business, Equipment, Other bicycles and tagged English Cycles, Eugene Oregon, frame building, Project Light, Project Right, Rob English, velomobile. Bookmark the permalink.